Fremont is excited to announce this year’s release of B-Bomb, their annual bourbon barrel-aged winter ale! 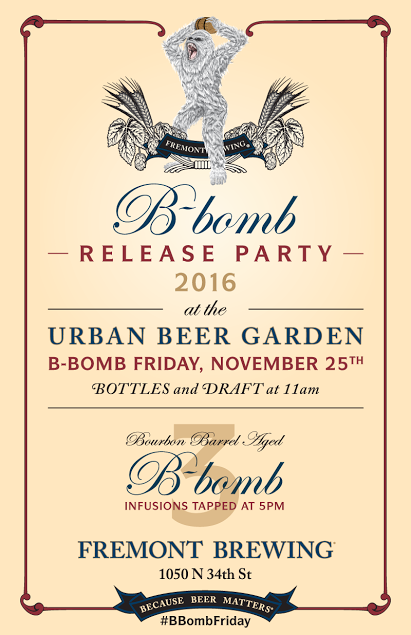 B-Bomb, formerly known as Bourbon Abominable, will be released in their Urban Beer Garden on “B-Bomb Friday”, November 25th! B-Bomb will be on-tap and available to-go in 22oz bottles at 11am. At 5pm, the legendary Yeti will join the party to help Fremont tap three release-party-only B-Bomb infusions! 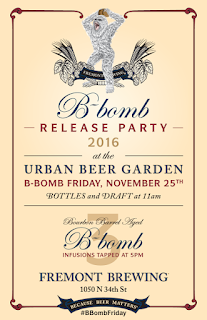 B-Bomb bottles are $20 each with a four bottle limit per person.